The English language has a group of words called CONJUNCTIONS that are used to connect clauses or sentences. Let me explain how. Without conjunction: I like cooking. I like eating. With conjunction: I like cooking and eating. Here, ‘and’ is the conjunction that joins the two sentences. In a way, Conjunctions can also be called as linking words. Although and Though, both are part of this group. Differences Between ALTHOUGH and THOUGH. As conjunctions, both the words are interchangeable as both mean the same i.e. ‘in spite of something’. • Although tends to be more formal than though. • One can use ‘even though’ to put more emphasis but one should never use ‘even’ with ‘although’. • ‘Although’ can be used at the beginning or in the middle of the sentence but not at the end of a sentence. ‘Though’ is more flexible. • Although his father was a king, Sam was brought up like a common man’s son. • Although Amit has a car, he doesn’t know how to drive one. • Certainly this could happen, although the possibilities are remote. • They will get married this year, although the date has not been decided yet. • Though I liked the sweater, I did not buy it. Note: The same sentence can be said/written with ‘though’ at the end and it would not change the meaning. I liked the sweater. I decided not to buy it, though. • Though they were talking in undertones, I could hear them. • Even though you don’t like her, you should try to be nice to her. • I wore my coat, even though it wasn’t very cold outside. NOTE: Even though is a stronger form of although. • He behaved as though/as if nothing has happened. • She ran so fast as though/as if she was being chased by a ghost. 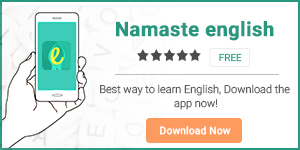 इसी तरह हिंदी के माध्यम व सरल तरीके से English सिखने के लिए download करें हमारी English learning app Namaste English और HinKhoj.